CLIFF TARAGLIA grew up loving the blues, but it's his striking resemblance to a British rock legend that sparked a new career. As front man for "The Rod Stewart Experience," Tartaglia struts his stuff, tributing gravel-voiced rocker Rod Stewart backed by the Rodband. Rather than an impersonator Cliff thinks of himself as a singing actor. "Onstage, I'm acting, portraying Mr. Stewart. Our goal is to give the audience a total Rod Stewart experience." A Chicago native and the stepson of blues legend Willie Dixon, Cliff took up the drums at age 6 and guitar a few years later. He is a singer and songwriter, performing with bands his entire life in renowned Chicago blues clubs such as Buddy Guy's Legends. During a stint with a cover band two years ago, Tartaglia and his bandmates added a Rod Stewart song to their set list. Cliff knocked it out of the park and has not looked back. "The Rod Stewart Experience" was born, pleasing audiences of all ages in Clubs, Theatres and Festivals. 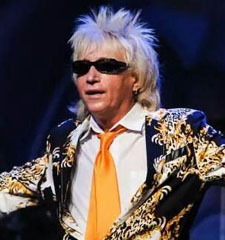 Cliff looks like, dresses like and sounds like Rod Stewart, but he is not trying to BE Rod Stewart. Rather, Cliff is paying homage to one of the world's greatest living legends. Cliff Tartaglia is based in Chicago.